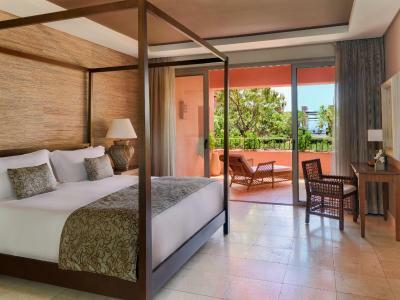 Lock in a great price for The Ritz-Carlton, Abama – rated 8.9 by recent guests! Abama private beach club for swimming and snorkeling. Free valet parking service with fully integrated reservation. Good location possibly the most scenic and beautiful route driving access to Teide mountain park which might seems very extraterrestrial planet. Best taste restaurant Txoko to experience the traditional Spanish nice meat of Tomahawk beef with Dry Aged 45 days. The grounds were extensive and well kept. There was easy walking. The lower pool by the Mirador Restaurant was particularly attractive and staff very helpful and food good. The housekeeping service for our room was excellent please thank the team for us. Simply the best staff EVER at EVERY single post. It is them, that make the incredible hotel what it is. 8 good restaurants and own beach but secluded from everything else. We did some guided tours (HostTenerife - Gregory exceptional!) but you can stay on site for everything. Most expensive on the island but it's the Ritz. We loved MB tasting dinner w wine pairing!!!!! Great hospitality from the first to the last day from all employees. Great room service , acomondation (we were upgradeted with vila room) , nature ... resturants were great but the best thing was the adults pool. Lovely staff, amazing resort, overall an incredible experience but service not so good by pool for drinks in main pools. 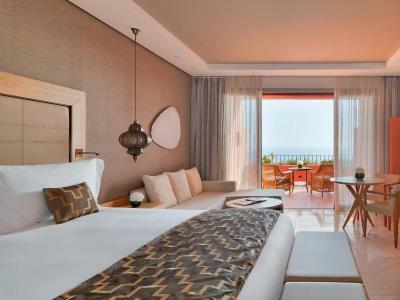 The Ritz-Carlton, Abama This rating is a reflection of how the property compares to the industry standard when it comes to price, facilities and services available. It's based on a self-evaluation by the property. Use this rating to help choose your stay! One of our top picks in Guía de Isora.In Tenerife’s Guía de Isora, this complex overlooks the Atlantic Ocean and neighboring island of Gomera. It has 7 outdoor pools and a spa, golf course, tennis courts and a beach. 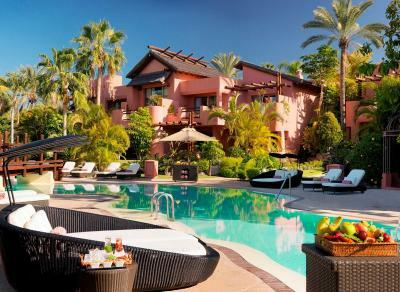 The Ritz-Carlton, Abama is made up of Moorish-inspired buildings housing guest rooms and villas. 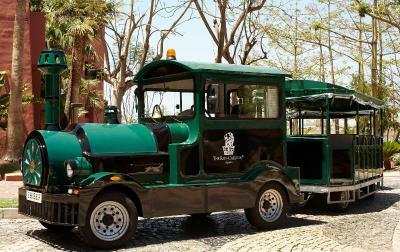 The resort is in lush tropical gardens on a cliff top, with a funicular train down to the exclusive beach. Each room and villa has an ethnic style, and most enjoy views of the gardens, and Atlantic Ocean. All have luxury marble bathrooms, and interactive TVs with internet access. 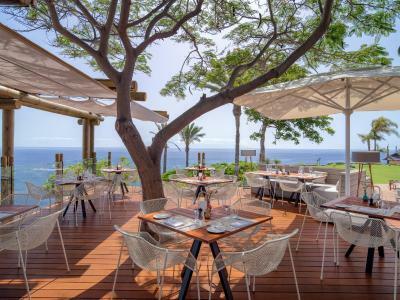 The Ritz-Carlton, Abama offers 10 restaurants. With 2 Michelin stars, MB serves dishes created by chef Martín Berasategui. Kabuki, with 1 Michelin star, offers innovative Japanese cuisine. 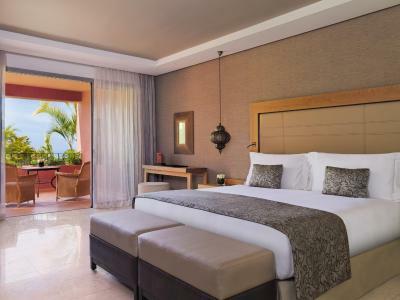 When would you like to stay at The Ritz-Carlton, Abama? 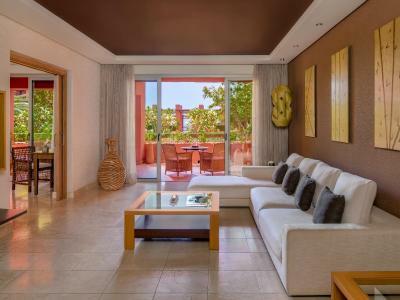 This spacious room features a private terrace with outdoor furniture and views of the gardens or swimming pools. This spacious suite features a private terrace with views to the resort. Elegantly decorated, the Junior Suite offers a king-size bed, a large fitted wardrobe with a chest of drawers and a marble bathroom with bath tub, separate shower and free toiletries. 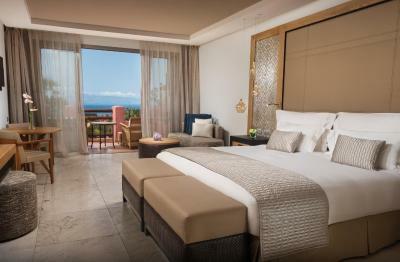 Located on the main building, this spacious suite features a private terrace with views of the ocean and La Gomera Island. There is a separate living room and a marble bathroom with a bath tub, separate shower and free toiletries. Located on the main building, this spacious suite features a private terrace with views of the gardens and swimming pools. There is a separate living room and a marble bathroom with a bath tub, separate shower and free toiletries. Separated from the main building, this spacious suite features a private terrace with ocean views. There is a separate living room and a marble bathroom with a bath tub, separate shower and free toiletries. The suite offers a king-size bed and elegant furniture including a large fitted wardrobe. Separated from the main building, this adults-only room includes special services as private check-in in the room, access to an exclusive pool with a selection of drinks and snacks, concierge services, complimentary WIFI and a free cart to move around the resort. Separated from the main building, this spacious suite features a private terrace with views of the garden or swimming pool. There is a separate living room and a marble bathroom with a bath tub, separate shower and free toiletries. The suite offers a king-size bed and elegant furniture including a large fitted wardrobe. Separated from the main building, these rooms have access to a private terrace and views of the gardens or swimming pool. 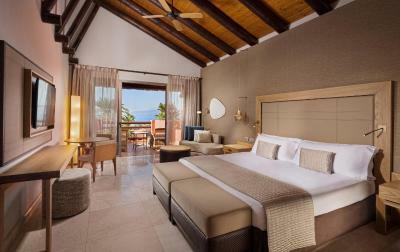 This room includes a terrace with outdoor furniture and impressive views of the ocean and La Gomera Island. 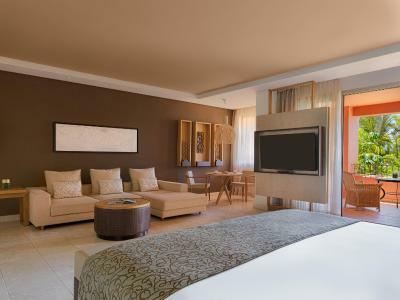 Separated from the main building, this adults-only suite includes special services as private check-in in the room, access to an exclusive pool with a selection of drinks and snacks, concierge services, complimentary WiFi and a free cart to move around the resort. Separated from the main building, this double room enjoy outstanding views of the Atlantic ocean. This suite has a cable TV, mini-bar and patio. House Rules The Ritz-Carlton, Abama takes special requests – add in the next step! The Ritz-Carlton, Abama accepts these cards and reserves the right to temporarily hold an amount prior to arrival. Please note that due to the high demand, guests interested in playing golf are advised to book tee times before arrival. Contact the property for more details. Please note that the Ritz Kids service carries a surcharge of EUR 6 per day or EUR 35 per week. Interconnected rooms are available on request and subject to availability. Please contact the property for further information. The hotel is understaffed. Items in your room like mini fridge and shampoo not restocked so you keep having to call room service. It took ages to get meals as service was sliw. Very friendly people but they need more! Nice big rooms and good choice of pools. Pool service could have been a lot better. Due to the hotel being full with two conferences and a wedding certain facilities were over stretched. Only thing I would have loved more of was to see more vegetarian options on the menus. No facility for late check out, I.e. a room for showering and changing would have been good as we didn’t leave until 3 pm and using the Spa to shower and change was not acceptable for us so we had to sit around for 3 hours in our travelling clothes. The prices in restaurants and bars were too high when considered against other local restaurants and bars. They seem to have been raised because as a resort style hotel, it was more difficult to get to other nearby venues and needed taxi or other transport to do so. The restaurants were adequate in quality but not outstanding. Not value for money. Advised hotel for 3 days in a row that the minibar fridge was broken and requested for this to be fixed. Never got done. Also advised that en-suite toilet couldn't be used due to sewage smell coming in. Smell was really bad and had to keep the door shut at all times. Again, nobody came to fix this. On check-out, I went through these points again with the hotel. They did not seem very interested by what I had to say. Really disappointing as this holiday was a surprise engagement to my partner, so this left a really bad taste to the whole experience.